Sunday April 28 (12–5pm) and visits available on other days by appointment. Curated by Chris Larson and Maria Cristina Tavera, THIRTY THREE VIEWS is an exhibition of artworks reflecting the vision, energy, and talent of 33 Twin Cities based women and non-binary contemporary artists. Lamia Abukhadra, Silvana Agostoni, Katayoun Amjadi, Rachel Breen, Julie Buffalohead, Rebekah Crisanta de Ybarra, Sayge Carroll, Martha Gabriela Driessen, Candice Davis, Mara Durva, Lauren Flynn, María José Castillo, Tia-Simone Gardner, Ruthann Godollei, Nooshin Hakim, Pao Houa Her, Elizabeth Breck Hickman, Alexa Horochowski, Essma Imady, Prerna Jambunathan, Sarah Kuza, Anne Labowitz, Heather Lamanno, Gudrun Lock, Alanah Luger-Guillaume, Paula McCartney, Ellen Mueller, Angela St. Vrain, Jenny Schmid, Jovan Speller, Sarah Katherine Stengle, Melissa Vang, Koua Yang and Laichee Yang. On view at the old Swedish Bank Building, the exhibit is organized as external programming of the Second Shift Studio Space. This innovative exhibition will occupy the entire third floor (5000 sq ft) of the vacant Swedish Bank Building at 965 Payne Avenue, Saint Paul for one week to coincide with the Saint Paul Art Crawl which is April 26-28, 2019. Saint Paul Arts Crawl is presented each spring and fall by the Collective, who relies on artists and others to volunteer their time and resources. The crawl began in 1977 when founding artists of the St. Paul Art Collective held their first group exhibition at Union Depot. The Collective continued to host exhibits in the downtown area in the following years before coordinating the first multi-building, open studio event in Lowertown in 1991. In the mid-2000s, the crawl expanded to also include a variety of other Saint Paul neighborhoods. Something I'm Thinking features new and experimental works by the University of Minnesota MFA candidates. In offering both fresh thoughts and persisting ideas, the works in the exhibition reflect the fecund headspace of the graduate art program. 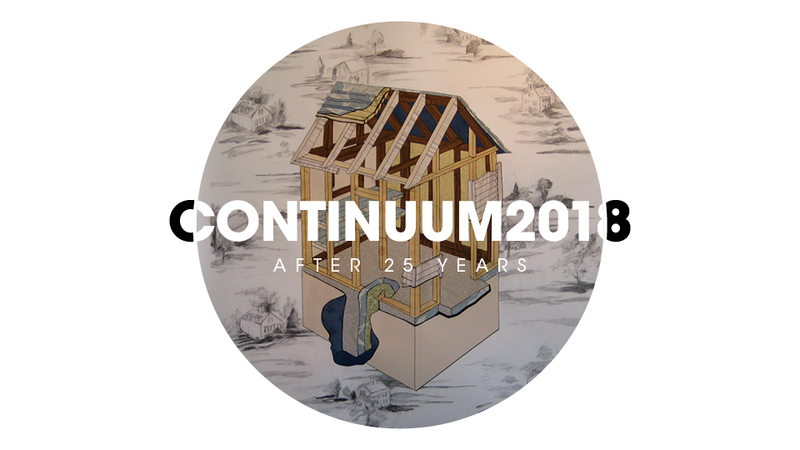 Continuum 2018: After 25 years presents Associate Professor Emerita Kay Knight’s works covering broad range of materials, sizes and subject matter used throughout her twenty-five year of teaching at UWM, along with the selected Painting & Drawing alumni works. The Alumni included in the exhibition are only a few of many that have passed through her classes during that twenty-five years. With this exhibition Knight wishes to express how much she has learned from all of her former students and hopes that she has passed on her love, knowledge and passion for the making of art. This event is a preview of "Tsev", a multi-medium art installation and dance performance, which will be showcased at Northwestern University's In Motion: Performance and Unsettling Borders Graduate Student / Performance Festival on April 28th at 7pm. This event is also part of theThird Thursdays on Argyle initiative. An experiential exhibition that sparks conversations and shares ways of knowing that center community and cultural relationships with plants that question the politics of the weeds. All events are free and open to the public unless noted otherwise. (Minneapolis) – Politics of Weeds is an experiential exhibition that sparks conversations and shares ways of knowing that center on community and cultural relationships with plants that question the politics of weeds. Artists and scholars Bo Zheng (City University of Hong Kong) and Diane Willow (University of Minnesota) are collaborating to present this month-long experiential exhibition at the University of Minnesota. Conceived as a participatory, social catalyst, the exhibition presents the work of SEACHINA (Socially Engaged Art in Contemporary China), the emergence of a Weed Party collective in Minneapolis/St Paul, and the cultivation of a series of participatory and interdisciplinary collaborations, conversations, teas, actions, performances, readings, and future imaginings. Guided by questions, debates, and embodied knowledge, Politics of Weeds becomes a creative catalyst to explore: how we work with plants to transform politics; how we propagate cultures of resistance, resilience, and re-imagination; and how we form and transform our relationships with plants. 02_Zheng, Bo Zheng and Chao Jiang, Pteridophilia, 2016, digital video (4K, color, sound), 17 min. Bo Zheng is an artist and teacher committed to socially and ecologically engaged art. He investigates the past and imagines the future from the perspectives of marginalized communities and marginalized plants. He has collaborated with a number of museums and art spaces in Asia and Europe, most recently Hong Kong Museum of Art, Power Station of Art (Shanghai), TheCube Project Space (Taipei), CASS Sculpture Foundation (UK), and Villa Vassilieff (Paris). His website: http://zhengbo.org/. 03_Willow, Diane Willow, A walk across time, 2015, video object, digital video still with exhibition title overlay, (4K, color), 40 min. This event is associated with the consortium, Mapping Transitions through the Vehicle of Arts, funded with the generous support of the Henry Luce Foundation, with additional funding from the University of Minnesota through the Provost’s Imagine Fund Special Events Grant, Institute on the Environment Mini Grant, and research support from the Undergraduate Research Opportunities Program, and the CLA Dean’s Freshman Research and Creative Scholars. The Katherine E. Nash Gallery is a research laboratory for the practice and interpretation of the visual arts. We believe the visual arts have the capacity to interpret, critique and expand on all of human experience. Our engagement with the visual arts helps us to discover who we are and understand our relationships to each other and society. The Katherine E. Nash Gallery will be a center of discourse on the practice of visual art and its relationship to culture and community -- a place where we examine our assumptions about the past and suggest possibilities for the future. The Nash Katherine E. Gallery will play an indispensable role in the educational development of students, faculty, staff and the community. The UW-Madison MFA Exchange Exhibition will open on Friday, December 1, 5-8p at the Quarter Gallery, Regis Center for Art, Minneapolis, Minnesota. For more information please visit the Quarter Gallery's website. Fresh wounds. Fresh mornings. Fresh dirt. Sometimes, an enlivening of the stale. Fresh play to refresh the way we work. This exhibition features fresh ideas from University of Minnesota Master of Fine Arts Graduate students. A smattering of new energy, experimentations, and efforts from folks creating in this very building. Barely there or laid bare to invite your viewership. A kinship among pieces with distance between. Space for you to figure and configure. Enter with fresh eyes. Join us for a closing event featuring Constructing Space, a performance and installation by Simcha Smith at 6:00 PM, followed by We do don’t we? We do don’t we?, a multi-media performance by Reb L Limerick and Jasmine Peck at 6:30 PM. St. Paul Almanac IMPRESSIONS Project. Magnolia Yang Sao Yia is a dancer, choreographer, activist and friend. I was invited to be a performer in her work. Find out more about this event by clicking the "Learn More" button below.